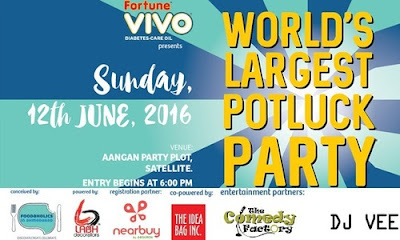 Having been recognized and certified by Limca Book of Records for conducting INDIA's LARGEST POTLUCK PARTY in December 2015, its now time to aim for Guinness World Records by conducting WORLD's LARGEST POTLUCK PARTY! Potluck = Dabba Party = Oodles of Food & Beverages! Last day for Registration is: 7pm on 7th of June, 2016. A potluck is a gathering where each guest contributes a dish of food that is to be shared. Potluck dinners are events where the attendees bring a dish to a meal. 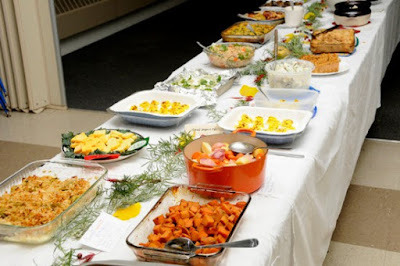 Potluck dinners are often organized by religious or community groups, since it simplifies the meal planning and distribution. The potluck supper is a great idea in theory: everybody brings one dish to share, and you end up with a feast. Gates open sharp at 6pm and close at 7pm, strictly so! If your clock reads 7pm and you can’t smell food, you might have missed it. As a standard bring food enough to serve 6 portions. More is welcome, waste isn’t. Cooked food is great but if you can’t, anything ready to eat will also do. For verification, proper counting and, fair participation, we will have several checkpoints. Please bear with us, it’ll be easier than an airport, we promise. You’ll be given a wristband to wear and a sticker with a bar code to put on your tee, it’ll look super cool! For evidence, we shall be clicking pictures of each and every participant who enters. Give your best pose! Once you enter you’ll be assigned a steward who will guide you through the process, stick to him/her, they also come with the additional feature of telling fun jokes. If you’re bringing friends along make sure you all enter together. Tables once allotted, cannot be changed. It’s a big day and everyone you meet will be an important part of it. So be patient with the slightly long proceedings, your grandchildren will be proud. As much as some of us would love to, alcohol and controlled substances are strictly prohibited inside the venue. Come and let's make a Wonderful Record!!! at WORLD's LARGEST POTLUCK PARTY!! !